OnlineVegetarianDeli.com. Most people who consume a conventional American diet need to eat more veggies. 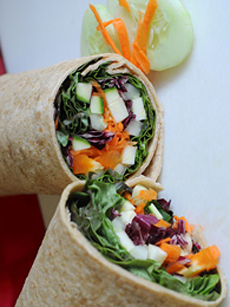 A painless way to do this is to switch your sandwich to a wrap, and fill that wrap with raw or grilled vegetables. The USDA reports that the white potato is America’s most widely eaten vegetable, followed by iceberg lettuce. Neither is a nutritional powerhouse. The deeply colored (green, orange, red and yellow), nutrient-rich vegetables, including dark leafy greens, make up only 0.2 servings of the 3.3 servings of vegetables Americans consume daily. Thus, we have some suggestions for what to wrap. Cut down on the protein (keep it to 3 ounces of turkey, beef, etc.) and fill the wrap with more vegetables. Substitute vegetable protein for animal protein: barley, brown rice, chickpeas, hummus, the pulse group (beans, lentils, peas), quinoa, tempeh and/or tofu, for example. Use darker greens instead of iceberg lettuce. They have more nutrition and antioxidants. Try arugula, mâche (lambs’ lettuce), mesclun mixture, mizuna, red-tip leaf lettuce, the green ends of romaine, spinach, Swiss chard and watercress. Add brightly colored vegetables. They also score higher in nutrition and phytonutrients (antioxidants). Include at least one. Avocado, bell peppers, carrots and tomatoes (fresh or sundried) are readily available. Toss in some chopped/slivered nuts and seeds. They add crunch, protein and heart-healthy oils: almonds, cashews, peanuts, pecans, pine nuts, pumpkin seeds, sunflower seeds (pepitas) and walnuts are good sources. Save calories on condiments. Use mustard, a nonfat yogurt spread (we mix the yogurt with garlic and dill) or a lowfat, low-calorie dressing. Finish with a whole grain wrap. Use whole-wheat or another whole-grain wrap for a nutritional home run. How to fold a wrap sandwich.